Geroge RR Martin's epic A Song of Ice and Fire saga has thrilled readers for over a decade and is now a hit TV show as well. You can tell your own tales of Westeros and play the Game of Thrones in A Song of Ice and Fire Rolplaying. This comprehensive core rulebook has everything you need to play out your own exciting stories of honour, adventure war, and intrigue in the Seven Kingdoms and beyond. Create your own noble house and characters and roleplay their adventures in the struggle for power, glory, and survival. Featuring a game system custom designed to evoke the atmosphere of the novels, A Song of Ice and Fire Roleplaying covers everything from knightly combat and large-scale warfare to courtly intrigue and house politics, all based on the same easy-to-learn game rules. Even your character's destiny plays a part, giving you a control over where the story goes. All you need are some six-sided dice and you are ready to play. 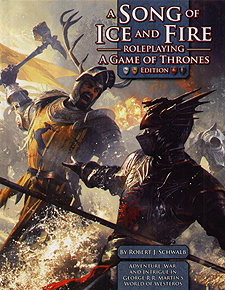 A Game of Thrones Edition is the deluxe core rulebook for A Song of Ice and Fire Roleplaying. It includes the entire contents of the original rulebook, revised and updated, plus the full length adventure Peril at King's Landing, complete with ready-to-play characters!